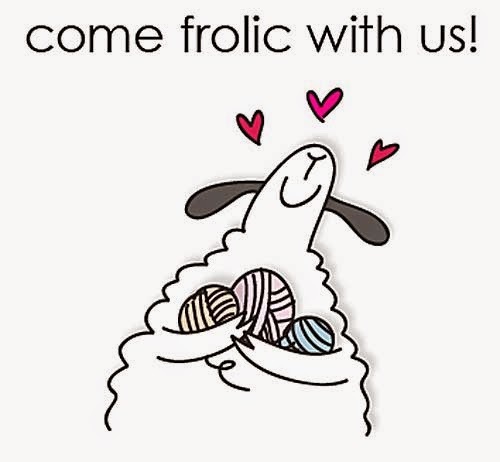 BeadFX is proud to be participating in the 2015 Knitter's Frolic marketplace organized by the Toronto Knitter's Guild. This exciting show has been running for 18 years and is the premiere event for knitting, yarns and other fibers. We will be bringing lots of seedbeads, findings, kumihimo needs, and much, much more! We'll also have the ever-popular Fleegle Beader needles in all three sizes (0.8mm, 1.0mm and 1.3mm) which is THE best way of adding beads to your knitting (if you're not stringing them on in advance). Workshops by the Toronto Knitter's Guild will be held on Saturday, April 25 and Sunday, April 26. Note: The Don Valley Parkway, from the Gardiner Expressway to Highway 401, will be closed from Friday, April 24 at 8 p.m. to Sunday, April 26 at 6 a.m. This may affect your route to and from the Frolic on Saturday. DVP will be open Sunday for anyone attending workshops that day. I love metal and metalworking. I love paint and colour. I have a new (old) house with tall and oddly-sized walls to fill. I am thrifty. 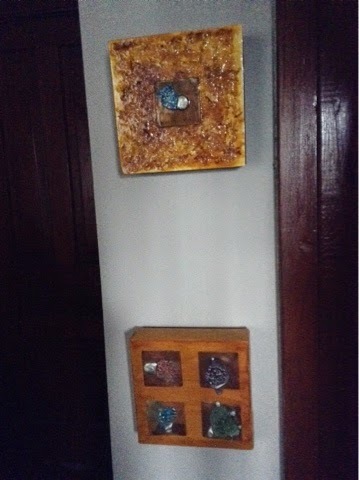 Therefore I've created my own wall art to suit my colour scheme and show off my skills. Here's a quick and easy tutorial on creating one of a kind pieces you can easily make at home with some basic art supplies and metal working tools. Loosen up and have fun with it! Prepare a working surface and paint the canvas. If you want an uneven surface, first put down modelling medium following the instructions on the jar. Let dry then paint. Cut out your copper squares (or rounds or any shape you're inspired by!) and file any sharp edges and slightly round the corners. Flatten gently on a bench block. Clean the copper of surface dirt and oil using steel wool and isopropyl alcohol. On my examples, each square is 2" x 2". 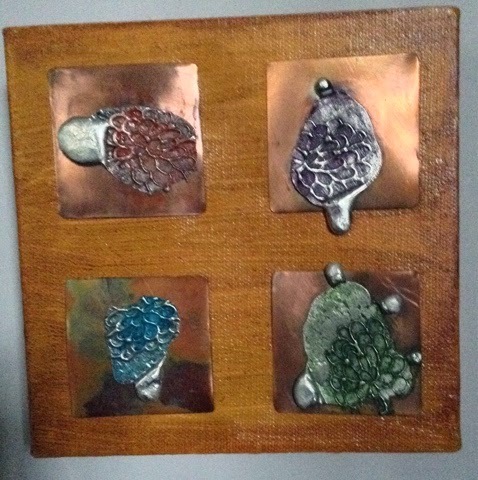 Place the copper on a solder block and paint with flux. Cut several half inch pieces of plumbers solder and place them on the fluxed copper square. Heat the solder directly with your torch until it flows. Turn off your torch and press your chosen stamp into the solder. The solder will take the imprint of the stamp and excess will blob out around the stamp, if you used a lot like I did. If you use less solder you will get tidier results. Experiment with it! Remove with tweezers after it cools a bit and quench in some water. If you want, add a few drops of alcohol ink and blot to mottle it or create different effects. Then glue to the canvas. 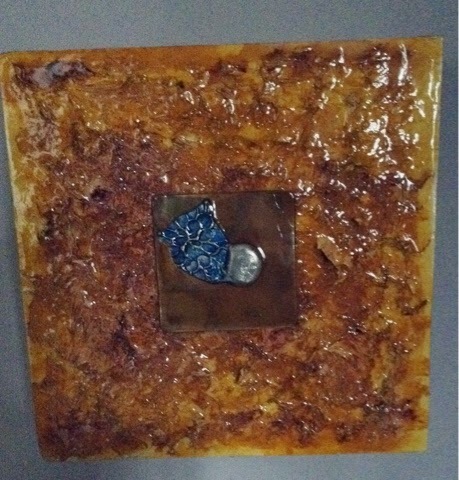 On the single square example above, I glued the copper onto the painted modelling medium then covered the whole piece with several light coats of resin, which you can purchase at art supply stores. Most canvases will come with finishing hardware. If not, you can pick that up at a hardware store too. Enjoy this technique. Photo idea bonus, for those who aren't comfortable with metal and torches. 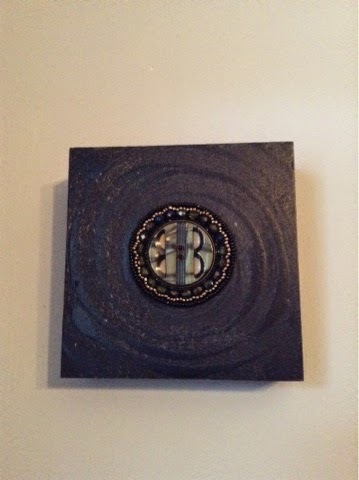 For this birch canvas hanging on the small wall inside my front door: I painted it with black gesso in a swirl pattern and then glued down a vintage button I embroidered around with Czech fire polish beads,vintage silver three-cuts and matte black delicas. Easy and very pretty. Guess what happened this week? I looked at the calendar and realized that my first summer craft show is in 10 weeks!!! EEEEEKK! Boy did that start a bit of a panic attack! There is SO much to do. There’s inventory to be made, a new booth to be built, photos to be taken and packaging to order. All of these tasks will get me and my work into a beautiful booth and looking lovely. Wait - there’s something missing. Not only do I have to make and display the work, I have to take care of the most important part. I have to tell my customers all about the work. Telling them where and how to buy this show season is a start. More important is to tell them ABOUT the work. Your customers choose to buy handmade work because they want to know the hands that made it. As fabulous as your earrings/mittens/painting/dress are, there is so much other nice work competing for their attention. Showing everything behind the work means they see yours as not just an object but as 3D story. I’m embarking on a 10 week campaign to rev up my customers interest. Here’s my 10 steps to build the excitement. Do one of these every week and get the ball rolling! 1. The idea or inspirations behind the piece or the collection. What made you think of the piece you’re working on? For me a lot of work is based on travel or food or flowers or a photo I’ve seen. Show your customers what you’re inspired by with a photo and add a few quick words. Adjectives are good here. Add 5 adjectives to describe the feeling behind the work. Sometimes I sketch the piece first, sometimes I throw a whole lot of beads and findings in a pile beside the photo. What do you do? Take a photo and share it. People LOVE sketchbook photos. This is where the magic happens. If your area is totally messy that’s fine, it makes it more real (that’s what I tell myself). Share a photo. Take a photo of your favourite tool and talk a bit about it If you use technical terms explain them. Remember, what is obvious to you is magic to your customers. 5. The piece in progress. What does it look like halfway done? Share a photo of the finished piece sitting on your workspace. If you, like me, are generating buzz for an upcoming show, document some of the process of getting ready for the show. How about a photo of packing your car? Or building your booth? Wrap your work up as the customer receives it. This is a great time to let them know where, when and how they can purchase it. 9. Out in the world. Show your work out in the wild. Hang your painting in a room, have someone wearing your necklace, put the mittens on a hand. If you’re buzzing up for a craft show, take a photo of your crowded booth. If you’re selling online, take a photo of a pile of packages being sent to the world. Provide social proof of how great you and your work are. This is the crafters version of those testimonials you see on the back of book jackets. In 10 weeks time my earrings will have gone from being a concept on paper to earrings inspired by the ocean, made in a torch that the customer has seen and understands (from my photo), from beads to final earrings, bought at my booth and worn at a party. They are no longer earrings, they are a story. Go ahead, it’s time to share your story. spring cleaning sales - continue to April 29! that's the sound we're hearing the most of around here - because this update is a doozy! Or, should I say, Druzy? Because we have a spectacular update this week - with amazing, yummy, fabulous items, and we're going to start off this guided tour with Druzy cabochons. Or Drusy, if you prefer. Or even Drusie - because apparently not even I can spell it consistently! We have a wonderful new selection of Stone Cabochons this week, including window druzies, that's the kind with the smooth stone with a "window" of crystals, or just all over crystals. Next - we have some turquoise cabochons. Actual turquoise - not imitation. With lovely patterns of the matrix in them. These are not huge, but would really make a project! And, some Opals! These ARE synthetic - they are man-made opals, but because of that, are much more affordable. And less finicky too - stronger and less susceptable to damage. And then, there are the stone cabochons ... oh myyyyy. If you dream of interesting, beautiful stone cabochons, dream of these ... Red Creek Jasper, in interesting shapes, Shattuckite - originally from the Shattuck mine in Arizona, now mined out, but a small deposit has been found in Congo. Perhaps you are a little baffled by cabochons - maybe you need an actual hole in your stones? Come on over to our Stone Donut and Pendants page! How about your Red Creek Jasper as an Inlay pendant? Beautiful pieces of Red Creek Jasper inlaid with a white stone border and set into a frame of amazonite or onyx, and with a large, horizontally drilled hole. Or what about this Brown Leaf Jasper - sold in matched pairs, no less! Or this lovely Amethyst Sage Chalcedony - which is earthy and ethereal at the same time. And, if you are looking for Inspiration on using the druzies - you can look at the very limited selection of pendants we got - mostly just for their inspirational qualities - although, if you must (wink, wink) have one - they are for sale! Also, you need to look at these - Arizona Blue Lightning Chrysocolla. Yum. Yummity Yum Yum. And then there are the Donuts! Stone Donut pendants, Square Donuts, and Gogo Donuts! OK - there is soooo much more - how do I tell you about it all? Amazonite! The price of this was insane this year at Tucson, but we found a stash of it that we bought a while back, so the price is - well - it ain't cheap - but it's not as crazy. Tree Agate - next to some of the flashy stuff we have this week, this might get lost, but, you know, graphic scribbles of sagey green on a white background is a pretty classy look! Metallic plated pyrite. Faceted pyrite stones plated with a metallic coating. Or just gemstones. Green Quartz, Labradorite, Turquoise, or graduated colour strands like Smokey Quartz or Amethyst. And some limited quantity strands of some fancy gemstones - in case you feel the need! And still - there is more! Modern Dzi beads, new Tassels! Here's a tip for those of you who want to take pictures of earrings. Heavy cardstock or matt board, centre cut out. Attach a stand or something to hold upright. Nylon line stretched across, held with clips or tape in TWO places. One to hang the earring off, the other to stabilized the earring, stop them from swinging for 15 minutes, twisting, or turning to an awkward angle. The earrings hang from the top line, and rest against the bottom one. So you get this ... retouch out the lines, or increase the lightness to get them to disappear. April Classes make the Grade -- No Fooling! More Madness ... More Pearls! March Madness ... and Pearl Restock! March Madness - 25% off everything! On sale this week - Swarovski Pearls! The Business Chat - So what do you do?